A newly-installed special viewfinder at Ruby Falls provides guests with the opportunity to witness the true colors of fall in the Tennessee Valley. Each year, a half-million guests from all over the world travel to Lookout Mountain to explore Ruby Falls, known for its underground waterfall and sweeping views of the Tennessee Valley. During autumn, the view is especially colorful with vibrant foliage dominating the landscape. However, until recently, those challenged with protanopia and protanomaly, also known as red-green color blindness, were unable to fully enjoy nature’s beautiful transition from deep green to striking red, yellow, and orange. 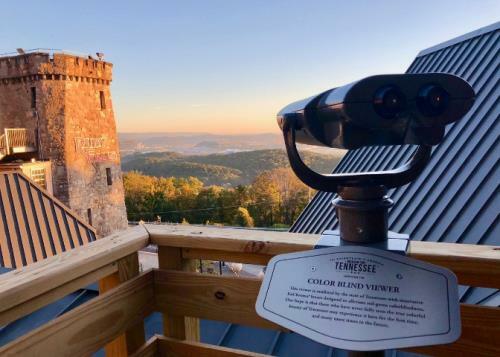 The Tennessee Department of Tourist Development selected 12 of the most scenic overlooks in the state of Tennessee as partners to install special viewfinders outfitted with an innovative lens designed to enable people with color blindness to see a wider range of vibrant, true colors. Ruby Falls received one of the uniquely equipped viewfinders in time for peak fall foliage season. The new technology viewfinder is placed on Ruby Falls’ accessible Blue Heron Overlook. The Overlook was completed in June 2018 and has a deep view of the Tennessee Valley and distant mountain ranges. Equipped with Enchroma lenses, the innovative viewer is the only colorblind-less viewfinder located in Chattanooga. The technology of the special lenses alleviates red-green colorblindness in order to see a broader range of the vibrant picturesque foliage just as it appears to individuals with typical color vision. Access to the Blue Heron Overlook and viewer are included with Ruby Falls admission. The color blind-less viewfinders are positioned at 12 different locations all throughout the state of Tennessee. For more information on where to find the accessible lenses, visit www.tnvacation.com.